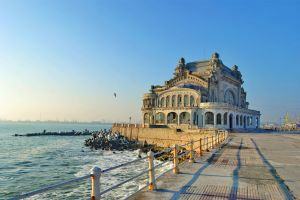 Are you planning to visit Bucharest? Booked a flight to Bucharest Otopeni Airport and want to know how to get to city centre? Want to know more about taxis, the metro, public transportation, safety and what Bucharest is like for tourists? 3. Official tourism in Bucharest - don’t count on it! Besides lots of useful info and local tips, each section has useful links that will make your trip to Bucharest stress-free and easier to enjoy. 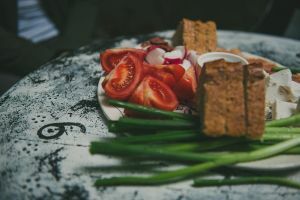 This article was updated in January 2019. Romania’s capital may not have the best reputation. Or any reputation at all, really. It’s still an undiscovered, lesser-known travel destination in Europe that can seem rough on the edges for first-time visitors who've heard about tourist scams and safety. I’ll be honest - some of them are true and the city can be a challenge for travellers used to other European capitals. But just like any other major capital in the world, don't be quick to judge only by its cover, buildings' facades, first impressions or others’ opinions on the internet. In fact, Bucharest is a lot more than that and has changed a lot over the past 5-10 years. It's a city of contrasts with a vibe of its own: Oriental influences, Balkan vibe and Western culture and lifestyle, mixed with communist landscaping, ‘old world’ French-aristocracy feeling and an undeniable lust-for-life Latin blood. It’s a combination unlike anything I’ve seen during my travels - Beirut came the closest to this cultural-clash of everything. And both have an amazing nightlife! Hip and modern crowds (aka millennials) blend with people who grew up in communist times. Behind ugly, grey and tall communist buildings you'll find impresive Orthodox churches, steel and glass skyscrappers or beautiful townhouses that speak of Bucharest’s golden years. 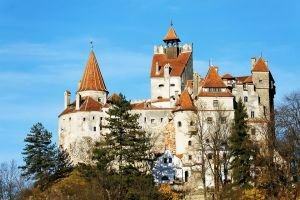 Bucharest is located in the Southern part of the country in the province known historically as Wallachia. Situated on plains, the city is quite spread out and continuously expanding. It is divided into 6 districts (sectors 1-6) for administrative purposes, but it doesn’t matter where you choose to stay and public transport is not influenced by this. 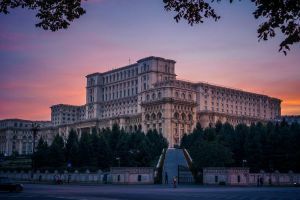 Don’t confuse Bucharest with Hungary’s capital, Budapest - both are equally interesting and worth visiting, but locals in both cities are very proud and annoyed when tourists confuse them! Bucharest is just over 400 years old and has been Romania’s capital since 1859 making it one of the youngest among European capitals. With an official estimated population of 2,2 million (but much higher in reality thanks to students and commuters) it dwarfs the country’s second-largest city of Cluj-Napoca which has around 350,000 inhabitants. Bucharest was once known as Little Paris of the East because it was heavily influenced by French culture and architecture during the 19-20th centuries, much like the rest of Romania’s middle class living in the city of those times. Unfortunately, this changed when the communist regime came to power in Romania in 1948 and eliminated any signs of aristocracy and wealth and deeply transformed the city’s layout and social composition. Entire communist neighbourhoods such as Militari, Crangasi or Berceni were built from the ground up with towering apartment buildings for workers to live in. An entire neighbourhood was demolished to make space for Ceausescu’s egomaniac project, the massive Palace of Parliament or House of People as he liked to call it, which is Bucharest’s most iconic and controversial building. Some say the city was 'tortured' by communist landscaping and landmarks, but our communist past is undeniable -- and fascinating! How safe is Bucharest for tourists? If you’re an informed traveller, generally cautious and not looking for trouble - pretty safe. Besides the usual tourist scams (stay away from anyone ‘offering’ their services or asking for help in an unusual way), pick pockets in crowded areas and rude taxi drivers, there’s nothing in particular seasoned travellers should be worried about. Solo female travellers should also feel safe, except for the occasional odd and long stares. As you will see, locals in Bucharest are very careful about appearances when going out and lots of stares are in fact ‘checking you out’ looks of admiration or curiosity. Weather in Bucharest is generally warm and pleasant. Like the rest of Romania, the climate is temperate-continental and all 4 seasons are still present. The best times to visit are during Spring (March - June) and Autumn (September - October) with averages of 15 - 25 Celsius, just right for walking in the city. July-August can get pretty hot (34 - 40 Celsius) and heatwaves are frequent, which makes air in the city pretty stale and unbearable without AC. Winters are generally frosty (below 0 degrees) and the amount of snow varies from none to a lot, but in December the city is beautifully decorated for Christmas and there’s mulled wine everywhere! Local authorities in Bucharest are doing a very poor job at promoting the city, developing tourist infrastructure and making visitors feel welcomed. This is the biggest reason why our capital is not very well-known as a travel destination and why I recommend you should continue reading this article. There is only one tourist information centre in the underground passage at Piata Universitatii, but last time I checked (August 2017) it was closed during weekends and the staff there was giving out recommendations for the usual touristy spots (such as the overly-touristic Caru’ cu Bere restaurant). Other than this, there are no other tourist info points in the city. Street maps are scarce and the only one I know of is in front of the Romanian Atheneum. So the best way to explore Bucharest's major sights and learn about the city's history is to go on a guided walking tour - unless you prefer to wander on your own! There is a Bucharest Tourist Card that offers disccounts to several museums, attractions, partner restaurants and cafes - you should check it out. There is also a double-decker tourist bus in Bucharest doing a hop-on hop-off route along major attractions and landmarks (website), but it runs only during June - October. I haven’t tried it but according to some reviews on Facebook, it’s not very reliable and service is not always great. Luckily, English in Bucharest is very common among young people who speak fluently and are very friendly. In restaurants, cafes, bars and tourist areas such as Old Town you won’t have any problems and even menus are in English. Other languages frequently spoken are French, German, Italian and Spanish, as the Romanian language is part of the Latin family. So if you need help or directions, you’re better off asking a young person rather than the middle-aged lady working in the subway ticket office. I couldn’t find the official Bucharest tourism website (not sure it exists?) and a lot of websites have info that is partially or completely outdated or confusing (including WikiTravel). Luckily you have a Romanian Friend to help and, besides, if you’re traveling in Eastern Europe it means you’re looking for some adventure and challenge, right? The major attractions, landmarks and sights in Bucharest are located on a North - South line from Herestrau Park to Piata Unirii, easily accessible using the blue metro line (M2). Most tourists flock to Old Town area (Centrul Vechi - Lipscani - Smardan street) where a lot of bars, clubs and restaurants are located. While the area is renowned for its nightlife, it has turned into a full-blown touristy spot (beware!) 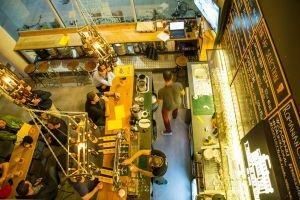 which locals avoid almost completely and prefer hanging out on side streets or bars in other areas. 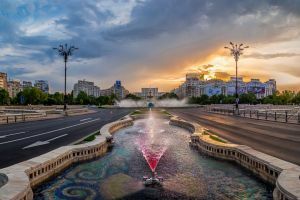 In fact, Bucharest is much more than that - Calea Victoriei, the Romanian Atheneum, Revolution Square, museums, parks and boulevards await - you might want to check our full guide on what to do in Bucharest or our Bucharest city break guide. 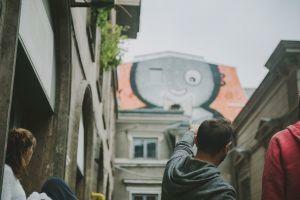 Or you can check some reviews from bloggers who've discovered the city for th first time, like Jurga from Full Suitcase who shares her hidden gems of Bucharest or Lavi from Continent Hop who described in vivid - and funny - details what she experience in our capital! Travel guides from foreign publications (such as LonelyPlanet or RoughGuides) and TripAdvisor rankings are useful if you want to see the usual top attractions and places where everyone (aka tourists) go - but none of the locals. Caru’ cu Bere is a good example of this and practically lives off of tourists. Over the last 5 years the city’s hip and modern urban culture has changed so much that the info in these guides are outdated, so expect to find a lot of cool and interesting places on your own. The biggest airport in Romania and closest to Bucharest is Henri Coanda (Otopeni) International Airport (OTP) and is located in the Northern outskirts of the capital in the small town of Otopeni - that’s why the short name for the airport is Bucharest Otopeni. See more info on their (official website). 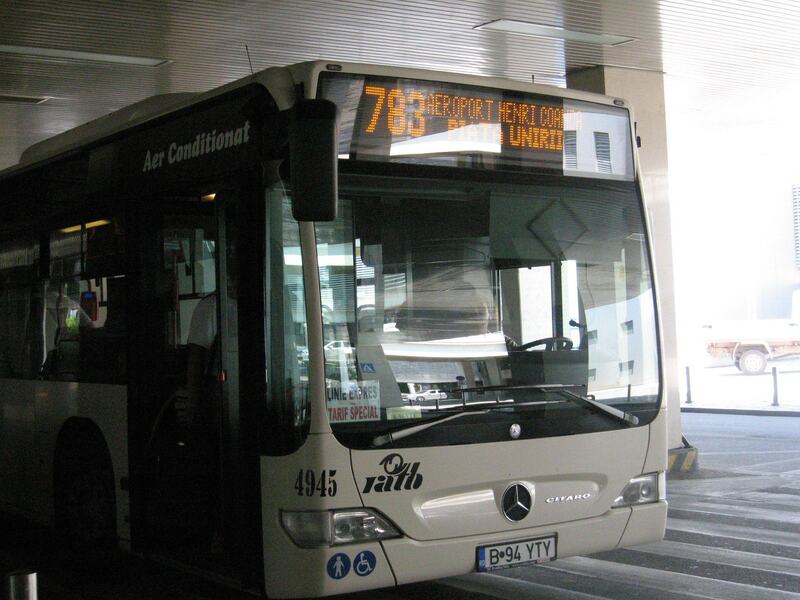 STB (Bucharest’s public transport company) operates 2 public bus lines from Otopeni Airport: 780 heading to North Train Station (Gara de Nord) and 783 heading to the city centre (Piata Unirii) making various stops along the way. Both leave from the ground floor outside the terminal building (international arrivals is at 1st floor) every 15-20 min on a regular daily schedule (Mon-Fri 6:00-23:00) and every 20-30 min on weekends and holidays. A two-way ticket is cheap (7 Lei ~ 2€) and you can buy one from the white ticket booth on your right when you exit the terminal building. Drivers don’t sell tickets and there's no way to get them online. Without getting into too many details about ticket options, just trust me and buy the BLUE card and ask the lady to top it up with 2 bus rides. Validate the card on the orange box when getting on the bus and check to see the green light turned on. For more info on the exact bus routes check STB's website here. Public transport in Bucharest (except for metro) can sometimes be unreliable and not in the best conditions (some don’t have AC during summer), so I wouldn’t recommend taking the bus if you’re in a hurry, arriving/departing during rush hours or not incredibly budget-conscious. 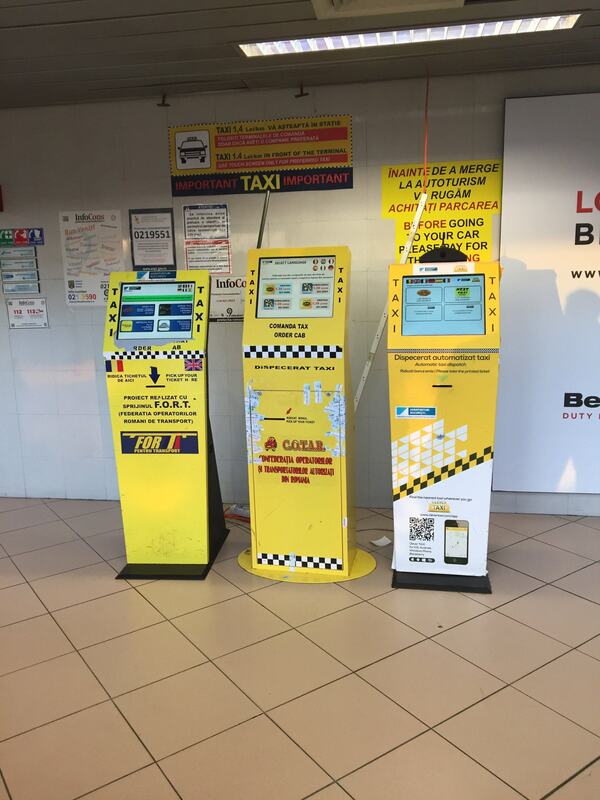 Safety tips: if anyone approaches you in the airport offering taxi services, refuse; if anyone wants to negotiate the fare, refuse; if taxi drivers outside the terminal building approach you saying that their clients didn’t show up (which is possible), refuse - unless they’re willing to accept the meter fare; when boarding yellow taxis, make sure the driver starts the meter before leaving, otherwise refuse the fare; many taxis have an LPG gas tank in their trunk which means that if you have a big trolley or travelling in a group with a lot of luggage it might not fit. Private car transfers have to be arranged before arrival. A good and popular service for this is Black Cab which will cost about 75 Lei getting into the city. Car rentals from the usual companies (Sixt, Avis, Hertz, etc) or local companies (Autonom) can be picked up from the airport. To get from Bucharest Airport to Brasov there are 2 options: either go to North Train Station and get on a train or use a shuttle company (we recommend Kron transfers or Direct Aeroport). Getting from Bucharest to Otopeni Airport you have the same choices, but if you need to leave during rush hours (7-10 and 16-19) there are high chances buses will be running late and cars will be stuck in traffic. Be sure to leave in advance and here’s one of my personal hacks of getting to the airport quicker: I take the subway to Aviatorilor Metro Station (blue line), exit on the left corridor leading out and take a taxi from there to Bucharest Otopeni. You might still catch some traffic, but you'll save a lot of time getting from the city centre to there. Local tip #1: food and drinks are outrageously expensive in Otopeni Airport (2-3x times higher prices). Pick up something from the city or a gas station on your way there. In case you’re hungry and looking for a warm meal, there’s a food court once you're passed security at gates 24 – 29. Local tip #2: exchange houses in the airport offer very bad rates compared with what you can get in the city. Change 20 Euro for taxi fare or use an ATM from a local bank to get Romanian Lei. The main train station in Bucharest is Gara de Nord (translated simply as North Train Station). This is where all national and international trains arrive and depart. If you come across other train stations such as Bucharest Baneasa or Basarab, just ignore them. Gara de Nord is always bustling with activity will give you the usual 'train station' experience: confused travelers, rushed locals, bored station workers, and, of course, scammers and beggars trying to get something out of everyone! Inside the train station there are many places to get food, sandwiches, drinks and there’s even a supermarket and exchange office. 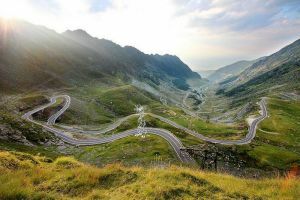 If you’re looking for info about buying train tickets and navigating Romania by train, check our guide on getting around Romania. From the train station to the city. When arriving in Gara de Nord look for signs leading to the ‘authorised taxis’ station which is down the very long, wide and tall corridor as you arrive (pictured above). You will be approached by people offering ‘taxi’ services - refuse. Outside the building if taxi drivers first ask where you’re going and then try to negotiate the fare, refuse. If you can’t find a decent taxi, use Uber or Taxify. Getting there. 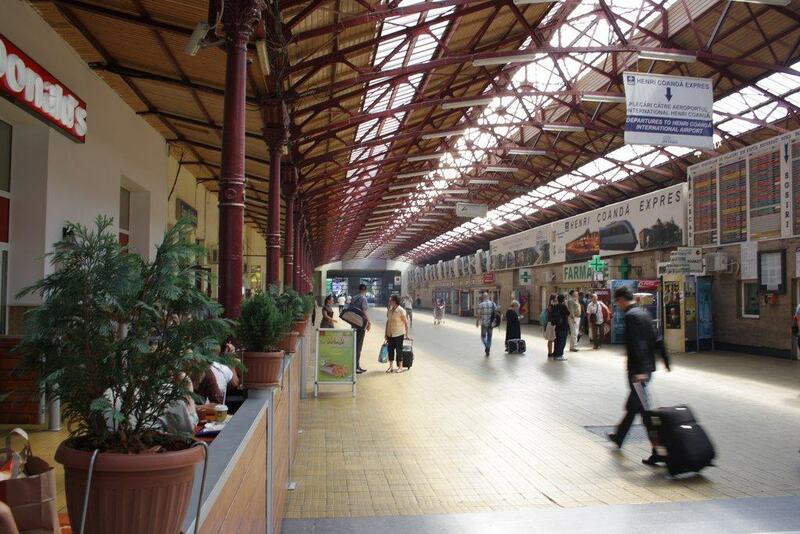 The North Train Station is located in the North-Western part of Bucharest. You can get there using the yellow subway line and get off at Gara de Nord station. For a cost of 2-4 Euros, a taxi or an Uber is a better and more convenient choice than taking the bus, and sometimes quicker than using the metro. The first piece of honest truth - taxi services in Bucharest should be treated with caution because their reputation is notoriously bad for good and many reasons which I won’t go into much detail. But if you follow my advice below on how to order a taxi in Bucharest like a local you’ll see how easy and safe it can be to use them and avoid bad experiences. The second honest truth is that taxis and hired cars are a very cheap and convenient way of getting around Bucharest, especially since subway stations don’t cover some parts of the city or tourist sights. Other public transport such as buses and trams are not worth the hassle, as we'll explain below. There are many official licensed taxi companies and their cars are yellow with the name of the company on the hood. Fares and rates are calculated per km: the lowest starts from 1,39 Lei, 1,69 Lei is standard while 3,5 Lei is for premium cars. Cost of rides should not be negotiated as fares are clearly written on both sides of the car and displayed on the meter (which should be visible) before and during the ride. A taxi ride from Bucharest to Otopeni Airport will cost about 30-40 Lei while most rides in the city will cost 10-25 Lei. Paying 10 Lei for a 8 Lei ride is common, as is rounding up or leaving a tip of 10% or 1-3 Lei. To put things into perspective, remember that 1€ = 4,7 Lei. Uber works in Bucharest since 2015. It’s cheap (around 1.3 Lei/km) and reliable, with great drivers and clean cars. But because it’s service is so great, it’s very popular and there's usually a fare surcharge because of high demand. Taxify is the runner-up and is the European version of Uber from Estonia with almost identical features and functionalities. It’s trying to aggressively acquire market share by having even cheaper fares than Uber (1,1 Lei/km). Some drivers use both apps which means clients have more options to choose from - yay! Clever Taxi and Star Taxi are local taxi hailing apps pooling licensed drivers from several pre-authorised companies. Unlike Uber or Taxify, you need to tell your driver your destination when being picked up and you will pay for your ride in cash. Most of these apps also work in Brasov, Timisoara, or Cluj-Napoca but in all other cities in Romania taxi drivers are decent, polite and safe anyway. The only taxi company I would recommend picking up from the streets of Bucharest (without pre-order) is Meridian. There may be other companies too, but I rarely use them since there are so many apps available. 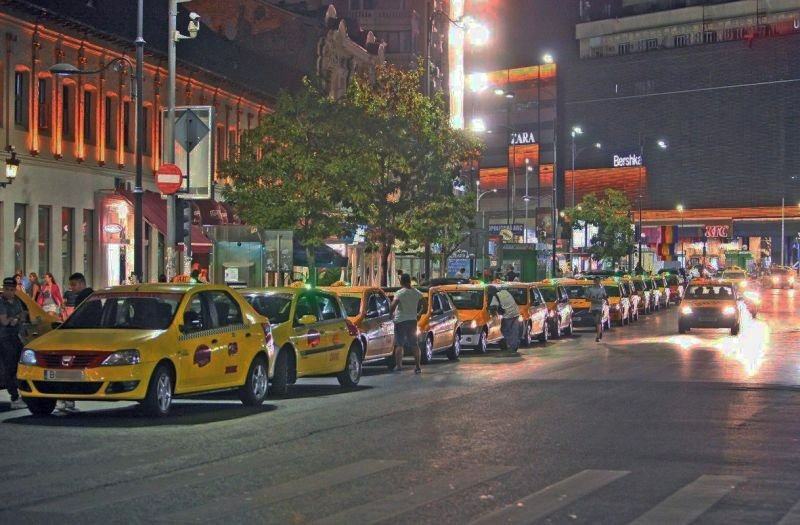 During weekends, especially in the evening when Bucharest nightlife goes full on or on rainy days, taxis will be in very high demand so be patient and several ways to find one. Getting a taxi from Bucharest to other cities such as Brasov, Constanta, Mamaia or Sinaia is something I don’t recommend - you can get better prices and comfort in a train, bus or even a private tour. Here are my safety tips when using regular taxis in Bucharest: make sure the driver turns on the meter when starting the ride and get out if he doesn’t or says it’s not working. Have small notes (1-5-10 Lei) on you to pay the fare as one of the most often used tricks is drivers saying they don’t have change. Avoid at all costs picking up taxis waiting in the Old Town/Lipscani area or North Train Station - they're the ones trying to scam tourists by overcharging. Try to be, as much as possible, informed about your route or at least have Google Maps ready when using a standard taxi. 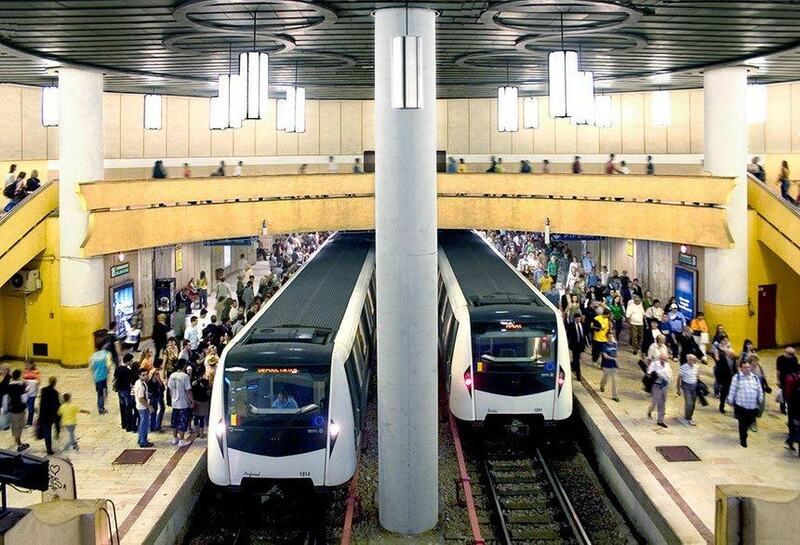 The subway network of Bucharest (metrou) is reliable, easy-to-use and fairly cheap. It’s by far the best way to get around Bucharest followed by taxis, even though it may be very crowded during morning and afternoon peak hours. There are 4 lines (M1-4) but the ones important for tourists are M1 (yellow) and M2 (blue). Getting on the right metro should be easy as there is only one train running on each line in a single direction. If in doubt, ask locals waiting. All metro stations are underground and are marked with an ‘M’ on a white square. The city centre is served only by 4 stops and there are some areas of Bucharest with tourist sights not covered at all by the subway. The metro stations around tourist sights are Piata Unirii, Piata Universitatii, Piata Romana, Piata Victoriei (the 4 I mentioned), Izvor and Aviatorilor. Check the full map here. Distances between stations can be quite long (10-20 min walk). Service is between 5:00-23:00 and trains run every 3-5 minutes during rush hours and 5-10 minutes during off-peak hours and weekends. Tickets are paper-printed and you need to validated them when entering the station, otherwise you can’t get it. A 2-way ride costs 5 Lei (1€) but your best choice is to get the 10 ride ticket for 25 Lei. Extremely cheap compared to anything else in Europe! The public transport network in Bucharest is made out of hundreds of buses, trolleys and trams, all operated by RATB. For tourists they are very confusing and hard to use, because there are no clear maps, guides, apps or English-speaking people or drivers working for RATB and able to give precise guidance to non-locals. Buses and trolleys don’t always have a dedicated lane so they get stuck in traffic. Drivers sometimes illegally use tram lines so trams get stuck in traffic too. And overground traffic in Bucharest is already heavy and crowded. So despite being very cheap to use, the hassle of getting on the right one, waiting ages for them to show up and getting stuck in traffic is not worth it. Except for regular commuters, most locals don’t use them so my best advice is to stick to metro and taxis. 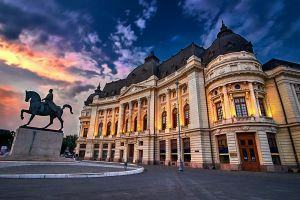 I hope this practical guide will help you plan your trip to Bucharest and Romania! 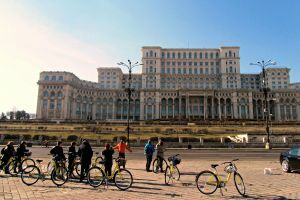 You might want to check our list with the best tours in Bucharest: walking and sightseeing, architectural or communism, nightlife and beer or garlic tasting - take your pick!